This 9,000btu, 4-in-1 system provides multi-season comfort. 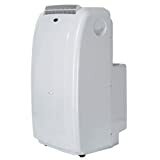 Designed to efficiently cool, dehumidify, or heat any space without permanent installation. Effectively improves air circulation in poorly ventilated spaces. Dual hose systems provide fast cooling. 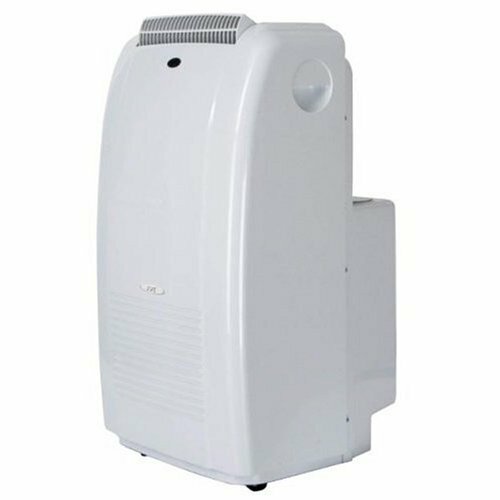 With one hose for air intake and the other for air exhaust, there is no negative pressure created inside the room.Self-Evaporating Technology - during the cooling or heating process, water is extracted from the air into the unit. In Cool mode, most of this water is recycled and used to cool the cooling coils. This creates improved cooling efficiently without adding energy cost. The moisture is then pushed out with the exhaust air, leaving you a virtually no-drain unit. In extreme humid conditions, if condensation collects faster than the unit can evaporate, the excess water will collect in the built-in tank. When the tank becomes full, compressor will automatically shut-off and unit will indicate that drainage is needed. As this technology does not take in effect in heating mode, continuous drainage is highly recommended when running in Heat mode.Note: Exhaust hose installation required (all standard accessories included). Included plastic slider kit forms up to 6.75 ft. Think very hard before buying this machine. We bought it with the hope it might actually cool down a room, or at least keep a room comfortable, but alas nothing of the sort was achieved. Instead we are left with a frightfully noisy and large thing that fails simply does not work. It is besides a very poorly engineered machine, demanding that one spends half an hour at a time just adding or subtracting one of the hoses depending on how hot it is outside. And then one is left to refit it to the window, which cannot be done without copious amounts of unsightly gaffer tape. The instruction guide is so idiotically conceived as to explain, with an entire page of the booklet, how to fit batteries into the remote, yet not a word was written on how to connect any of the hoses, nor how to adjust the vent.